This is a piece I wrote to read at the Unitarian Fellowship on Christmas Eve in 2009. It was the first Christmas I spent without my children following my divorce. As I got to the end of it, I couldn’t read on. I asked my friend Liz to finish reading it for me, and sat crying silently as she read the last few paragraphs. It was another painful Christmas, mourning a particular loss. The next morning I woke up and drove through a fresh 6 inches of snow to my friend Douglas’ house, and spent a long Christmas day with him and his 100 pound German Shepherd, Otto. We ate a southern Christmas feast, and listened to a lot of vinyl. I was sad, but as it often was in those difficult months following my divorce, the comfort of Doug’s familiar living room, his easy company – our universe of two was a balm to me.This year of course, I’m thinking of Doug and his family, and what a hard year it will be for them, with his tragic end so fresh and new. I hope healing comes in some form for them. I pray for grace. I imagine it will come in the form of music. I think it is good to cry. The year after my sister Julie died, my mother gently informed me she didn’t have the heart to “do” Christmas. This did not disappoint. I was seventeen, long past believing in Santa Claus. As a particularly self-involved teen, I found my family at turns both irritating and embarrassing. And as the baby of the family whose siblings were all married with children, I often felt awkwardly displaced somewhere between the kids table and the grown ups. I was, possibly, too cool for Christmas. Anyway, I had to work. I was a an “on-air personality” at the local polka radio station. Every DJ was obligated to work a three hour shift on Christmas Eve or Christmas Day and I always volunteered for Christmas Eve. Now, I hated Polka. Christmas Eve was the one night of the year I didn’t have to play it. Instead, I munched on Christmas cookies that Helen our long-suffering receptionist baked, smoked cigarettes in the newsroom, and gorged myself on Bing Crosby, Elvis and Barbara Streisand. Our station overlooked our tiny picaresque downtown Main Street, and I’d stand at the window feeling older than my teenage years, nostalgic for a past I never knew when crooners crooned and families didn’t get divorced, sisters didn’t die in head on collisions, and people still went to church on Christmas Eve, at least. I’d turn the lights off in the studio, and strike a sort of noir pose while the streetlights blinked red and green on the deserted street. This year I was assuming a very hard-boiled outlook. My sister’s death had left me both emotionally raw and prematurely adult in ways I couldn’t begin to understand. My response was a poor attempt at cool detachment. When I got off work at nine, I had plans to drive out to Holy Hill, a stunning church on a hilltop in the nearby countryside, for midnight mass. 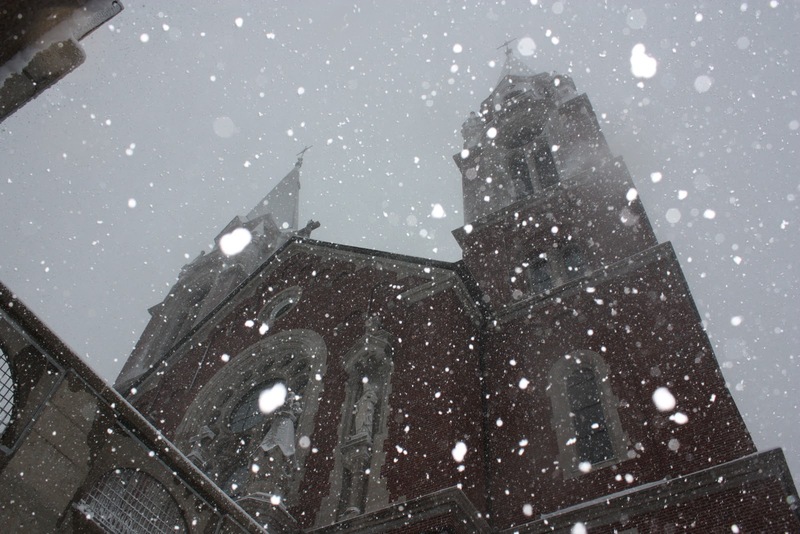 Holy Hill is a Carmelite Monestary and minor Catholic Basilica. The Neo-Romanesque shrine itself sits on about 40 acres, surrounded by an additional 400 acres of rolling woodlands. It features a 192 foot tower from which, on a clear day, you can see Milwaukee thirty miles away. The interior of the church is an amazement considering the rural setting; 20 foot rose windows, 8 foot marble statues, gold leaf frescoes and glass mosaics. When my sister Julie married into a large Catholic family, she converted – partially to appease the family, and I think, so that she could be married at Holy Hill. The church entrance is on Highway 167, a designated scenic “rustic road” that winds and bends through the kettle moraine landscape. In the fall, tourists flock to drive the beneath canopies of riotous color on sun-dappled pavement. In the spring, pilgrims descend on the church to walk the stations of the cross. In the winter, the roads are icy, poorly lit and treacherous. My sister died on this same road in June, on a warm and rainy morning, making her way to work. A few miles from the church, one of my closest friends Angie lived with her family in a remodeled barn. I was a frequent guest at their home, and actually, I think I might have earned resident status one summer. The Balistreris embodied an idea of family that was completely foreign to me, romantic and captivating. The parents Frank and Mary were hot blooded Italian Americans, artists and hippies who had moved from the city as part of the “back to the earth” movement. Angie was the eldest of five. In contrast to my single-mother upbringing, the Balistreri house was in near constant upheaval. They were always low on cash, the kids fought bitterly, the parents and children recriminated each other on a daily basis. There was shouting and tears and a sense of overwhelming love and togetherness. I stopped in before the service, because the choir didn’t start until 11pm. The family was in the middle of exchanging gifts. Recently, Christmas at my house had become an escalating affair, with the pile under the tree spreading further into the room every year. I was humbled and heartened to see what the Balistrieri’s exchanged. Shampoo, one book, a wooden hairbrush. Every gift was accepted with gratitude and embraces were given in exchange. The highlight of the evening was the gift for young Peter, just over a year old. Frank had made a perfectly plain and beautiful red wooden wagon. As he wheeled it into the living room the whole family exploded in applause and laughter. I had been quietly drinking tea on the couch, but was suddenly overwhelmed with emotion. I slipped out the door and heaved sobs into the crisp night air. I cried because I felt so blessed to be a part of this family. I cried because I was not really a part of this family, but my own. My own family broken first by divorce and now, death. I cried because I missed my sister, and I missed my mother, who was irrevocably changed. I cried for myself, because it was such a burden to feel so deeply, to feel so old when I was so young. Angie’s mother Mary found me, and held me silently. There was no need to tell her what the matter was. I cried until I was shivering, thanked her for having me, and said I would head up to the church now. In retrospect I might have skipped the service, being as I was nearly out of control with emotion. A sane person would have. But grief is not the territory of the rational. I was now an open wound, numb with the night air and blind to reason. The stars and midnight sky were bright against the steeple spires as I made my way up to the church. There was no room to sit, so I found a place near the back wall, shoulder to shoulder with strangers, our puffy winter coats whispering against each other. The choir filed in holding candles and singing O Come O Come Emmanuel. It was achingly beautiful. I held it together for about five minutes, until they started in with O Holy Night. Then, I crumpled. I slid down the cold wall of the church and buried my face in my hands, weeping openly, audibly. I lost control of my voice – the word caterwaul comes to mind. People stared: I am ruining their Christmas spirit. But I couldn’t stand. Someone helped me up and I with my head down I ran for the door. Tears froze on my cheeks. When I got to my car I sat with my forehead against the cold steering wheel and beat it with my hands, until I was finally calm enough to drive. On the way home I tuned in to my old Polka station and drove careful, careful along the frozen roads listening to Elvis singing Blue Christmas. When I finally made it home – warm, and quiet and dim – I was grateful. The truth is, I’ve never felt more connected to my sister than I did that night. And that is the reason I return whenever I can to Holy Hill Midnight Mass. I’m really not one for visiting graves. When I go to my sister’s grave, I just feel awkward and inauthentic. Only her bones are there. But amongst the incense and the hymns in the cold upper church of a Carmelite monastery, I feel happily at peace with her. Though my family now celebrates together at Christmas, this pilgrimage I always make alone. To reunite with old friends and reconnect to a sacred place. And when I can’t get there, at least I have music. I listen to the carols I love, and happily, I cry. Beautiful. Grandma took me to Holy Hill once, and it makes me happy to think of quiet Julie at the center of attention in such a grand place. Light her a candle for me, won’t you?